Summer can be hard in NYC. 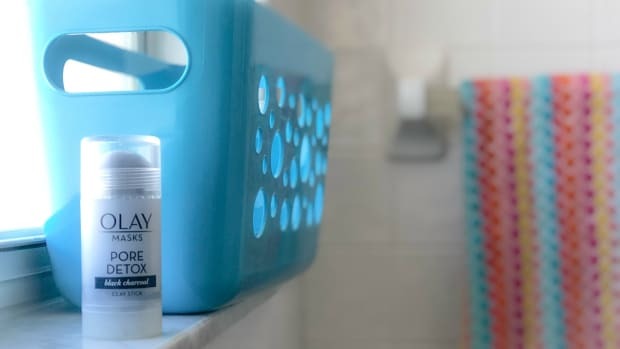 Parents are constantly seeking ways to keep their kids entertained, engaged, and occupied; and balance physical outdoor activities with relaxing downtime inside. And that&apos;s where these amazing playrooms come into play (get it?). 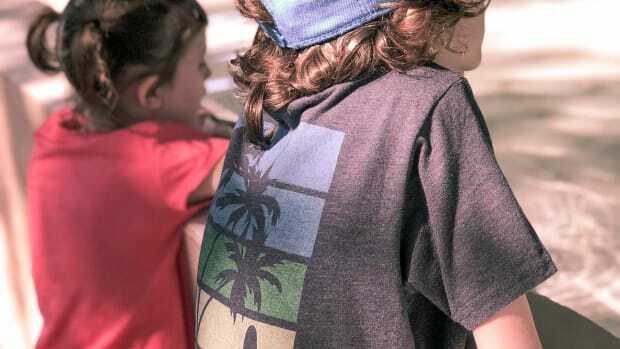 They&apos;re designed to educate and inspire tykes, toddlers, and families. Each of the rooms below, located in a luxury NYC building, offers a picture-perfect backdrop and an opportunity to cool off and blow off steam. With a monochromatic design that also features pops of color, the light-flooded children’s room at The Grand at Sky View Parc features the perfect backdrop for shots of little ones doing whatever activity suits their fancy. Those who prefer fairy tales can roam through the built-in castle, while the more creative-minded can visit the art display corner and demonstrate their artistic talents on the chalkboard. The studious set can catch up on summer reading near the interactive built-in bookshelf, or view the ceiling’s creative constellation ceiling. Interactive chalk walls? Check. Book shelves that look more like art installations than a library? Check. 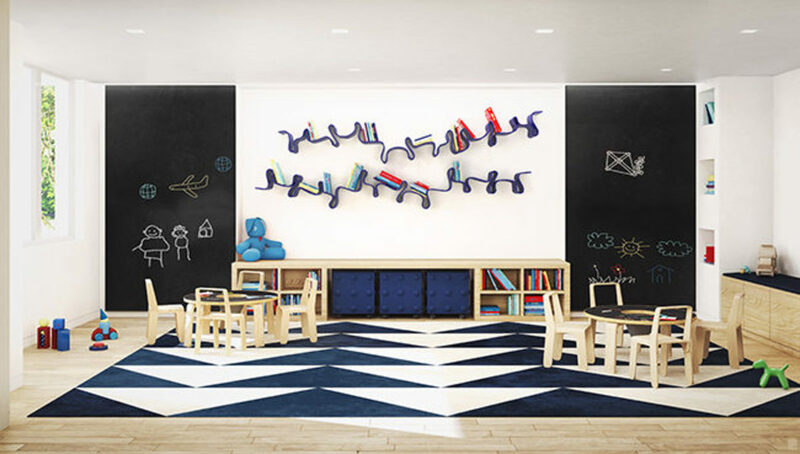 The quirky playroom at Hell’s Kitchen luxury condominium Fifty Third & Eighth celebrates the creative spirit of the surrounding vibrant neighborhood with space for children to draw, read and play with provided toys, keeping kids occupied and parents happy. The artistic children’s playroom at luxury Yorkville condominium Citizen360 is a creative kid’s paradise, including enough playful design elements to inspire young ones to draw, paint and otherwise create. The spacious light-filled room features quirky fabrics and lighting fixtures, as well as various places to sketch, like chalkboards and drawing tables, making for the perfect setting for snapping creative tykes in action. boasts a playroom with an environment that stimulates education, socialization and fun—equipped with a gaming console and a wide selection of games that keep the heart healthy—as well as a study lounge outfitted with iMac computers to keep the red pens on the mark for writing ‘A+’ only. Residents at 50 West, one of Downtown Manhattan’s most family friendly luxury towers, will have access to a unique children’s room where kids can play with the play set designed by CedarWorks, solve puzzles on the puzzle wall, practice their reading skills in the reading corner, play chef in the play kitchen and learn about gardening at the community garden on a nearby terrace. 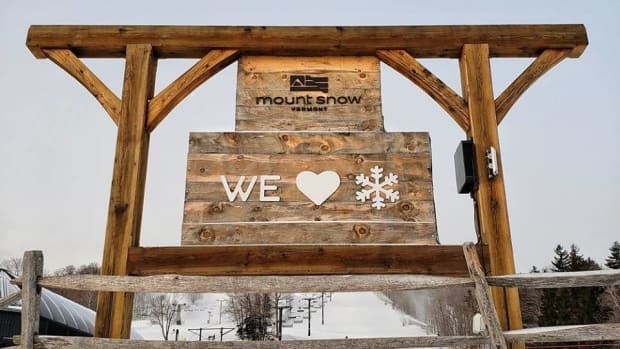 Children will never be bored at 50 West, and neither will their parents’ Instagram followers! 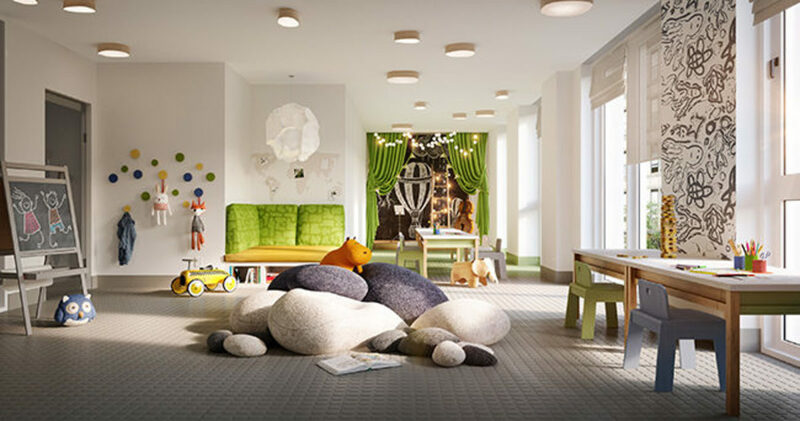 Glenwood’s Barclay Tower, a high-end rental building located at 10 Barclay Street, features a children’s playroom that pays homage to its lower Manhattan location. In a scene set on the Hudson River just below the ever-picturesque Brooklyn Bridge, a miniature tugboat lets toddlers pretend they’re zipping around New York Harbor taking in the sights. 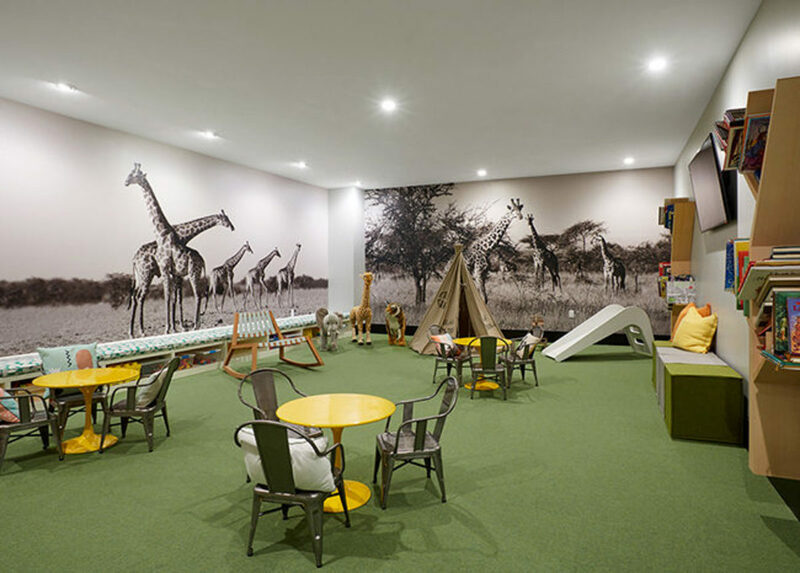 Designed by Hill West Architects, Brooklyn’s first residential development along the Gowanus Canal features 40,000 square feet of amenity space which includes a safari-inspired children’s playroom for those adventure-seeking tots. 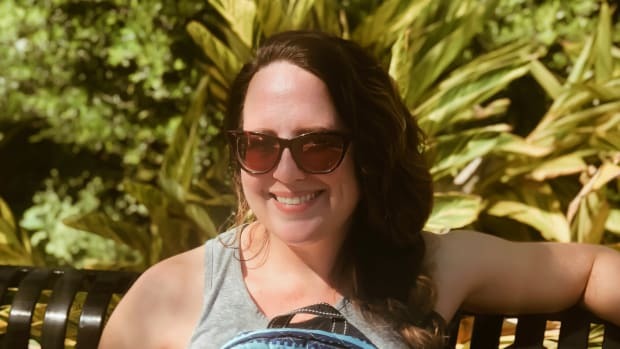 The thoughtfully curated room features floor-to-ceiling artwork, plush décor and accent pillows with wild animals native to sub-Saharan Africa. Trendy accents include an Instagram-worthy kid-sized yurt and mini slide. 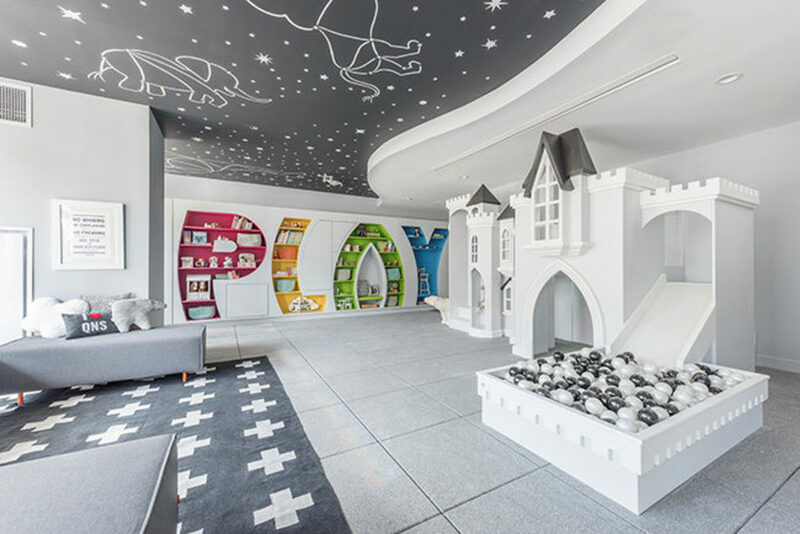 Situated in the heart of Brickell/Downtown Miami, Brickell City Centre’s REACH and RISE residential children’s playroom each features an extremely hi-tech, innovative space to rival the savviest adult amenities. 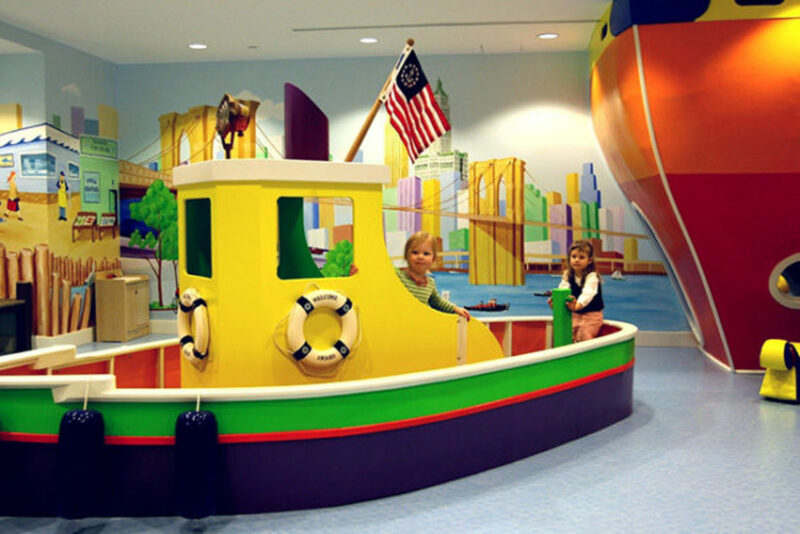 With several walls with interactive, touch-screen games (while others remain blank for children to write and draw pictures allowing for creative expression), the playrooms boasts a collection of giant models to facilitate the ultimate role playing experience that includes a fire station and engine, a multi-level castle, and a pirate ship with a nautical backdrop. What’s more? 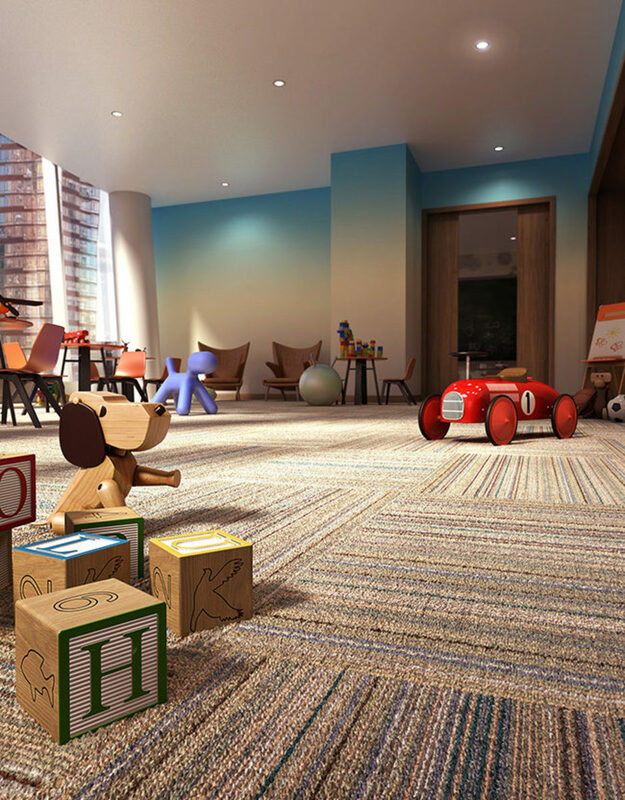 The playroom is viewable from the towers’ state-of-the-art (adult) fitness center, meaning parents and loved ones can supervise their children’s playtime without having to sit stationary on the sidelines.